Even the most emotionally stable people will reach a point when the pressure and frustration gets to be too much and they’ll lash out in some way or the other. 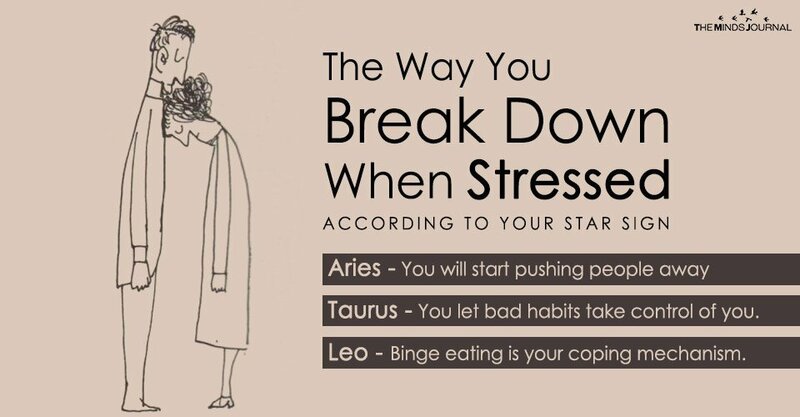 Different people will have different ways of crashing and burning and their Zodiac signs give you a rough idea about by predicting their behaviour beforehand. Holding all those emotions inside for so long is finally taking its toll. The trivial of things will set you off when you are frustrated. One little thing out of place will make you want to scream your head off. All these volatile emotions will leave you lashing out at the people around you for no reason at all. You’ll start pushing people away because you can’t keep a hold on yourself. At first, you’ll think an indulgence now and then is fine, but pretty soon, your vices will get the better of you. From alcohol to cigarettes and dependence on substances will drastically elevate to falling back into the same negative patterns with past lovers leaving them and going away, you’ll only make yourself go deeper into the vicious cycle of self-destruction and substance abuse. These vices will only heighten the stress and anxiety you’re already drowning in. All the worries and anxiety rolling around in your mind will keep you from relaxing. You’ll keep saying to yourself that you’re drop dead weary, but the moment your head hits the pillow, you will reminisce about the pending errands. This makes things worse because the lack of rest makes it even more difficult for you to deal with the physical and mental burnout. When you are under immense pressure, you get disorganized very soon. You try to make a to-do list, but then you forget to follow that too. No matter how much you try to focus, the immense pressure you feel will take up all the space in your mind. You’ll fumble up even the smallest and easiest of tasks because your thoughts will constantly wander off, being unable to focus on anything at all. When under stress, binge eating is your coping mechanism. You’ll practically inhale tons of unhealthy foods you can find. And when you’re not binge eating, you’re not eating at all. You get so busy that you constantly keep on skipping meals to compromise your health for work. Whatever is going on inside of you is clearly reflected on your external appearance. You start to let yourself go little by little. Day to day tasks and self-grooming like washing your hair, ironing your clothes, cutting your nails, applying a little makeup, etc. all fall to the wayside as you become completely absorbed in whatever is causing all the stress. You let the stress get the best of you and totally devastate you in the process. Tears constantly keep welling up in your eyes. It doesn’t matter how trivial you’d find the issue otherwise, under that fog of stress and anxiety, everything seems to have been magnified tenfold.